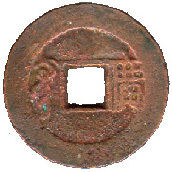 This coin was cast by the Changsha Mint of Hunan Province bearing with the "Nan" mint marks written in both Manchu and Han script on the reverse. In 1697, Hunan cash were forbidden to circulate in the market as they were too small and light. 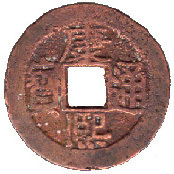 Actually, Hunan copper cash were still used in 1708. Hunan Mint was closed in 1700. 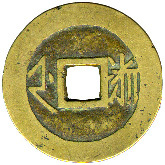 Kaifang Mint of Honan Province was established in the tenth year of the Shun Chih reign (1653). In 1667, all the provincial mints were reopened. 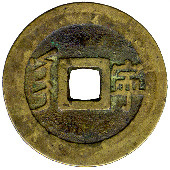 Kaifang Mint cast the K'ang Hsi T'ung Pao again with the "Ho" mint mark in both Chinese and Manchu characters on the reverse. It ceased minting three year later (1670). It actually had cast cash for three years only. 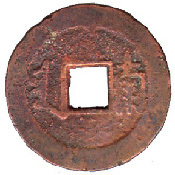 In the Qing Dynasty, the mint marks in both Chinese and Manchu characters on the reverse of the coin are normally indicated where the coin was cast. 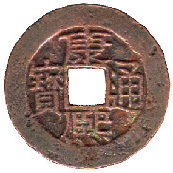 But the identifying character of this coin, "Ning" in both Han and Manchu script on the reverse is used for Ninghsia Mint (now Kansu) or Kiangning Mint (now Nanking of Kiangnan province)? 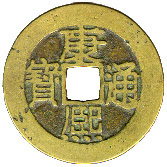 The third suggestion for this mint mark is Ningpo Mint of Chekiang Province. According to the book "Ku Ch'ien Kao Lueh" wrote by Mr. Ch'ien Wu Chiu in the Taokuang period (1821-1850), "Ning" is used for Kiangning Mint of Kiangnan province. On the other hand, I find that there is no record of Ninghsia Mint and "Ning" is referred to Kiangning Mint in the official record , "Ch'ien Pi K'ao" of "Ch'ing Ch'ao Wen Hsien T'ung K'ao", ( A Comprehensive Historical Compendium of the Documents of the Qing Dynasty, numismatics) wrote in the Chien Long period (1736-1796). On the contrary, character "Ning" is referred to Ninghsia Mint in "Chih Ch'ien T'ung Kao" (A Comprehensive study of Chinese Coin) wrote by Mr. T'ang Yu K'un in 1852. Most of the 20th-century numismatists, including Mr. Ting Fu Pao, author of "A dictionary of ancient Chinese coins." and Mr. Pang Hsin Wei, author of "The Currency History of China", believed that "Ning" was used for Ninghsia Mint, but I think both of them were followed the informations provided by the book "Chih Ch'ien T'ung Kao". Mr. Fr. Schjoth had wrote that "Ning" was used for Ningpo Mint in Chekiang Province in his book about Chinese currency. About the identifying character of this coin, "Ning", I thought about it over and over, and decided that it should be applied to Kiangning Mint (now Nanking). 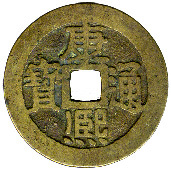 Kwangchow Mint (Canton) was first established in the 7th year of K'ang Hsi reign (1668AD), for the casting of the cash coins , each weighting 1.4 mace (rare now). 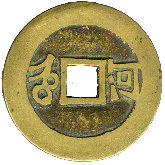 On the reverse are mint marks "Kuang" in both Manchu script and Han script . It ceased minting in 1670, until the 25th year of K'ang Hsi reign (1686AD) it resumed minting of coins reduced in weight to 1 mace with the newly established Chao Ch'ing Mint. Chao Ch'ing Mint was closed in 1687. Kwangchow Mint cast coins of 0.7 mace in weight during 1695AD to 1698AD. [1 mace = 3.73 gram] The use of cash coins had lasted until the 16th year of the Republic of China (1927AD) in Kwangtung province, but the cash coins had fade away gradually from the market after 1931, as the "T'ung Yuan" [ Copper coin ] was quiet popularly used in Kwangtung province. Hangchow Mint of Chekiang Province was first established in the 6th year of Shun Chih reign (1649AD). After it terminated casting coins in 1662, Hangchow Mint reopened to cast coins again in 1667. 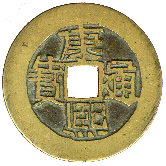 It cast coins of "K'ang Hsi T'ung Pao" bearing with "Che" mint marks in both Han script and Manchu script on the reverse. It ceased minting in 1674. In the 35th year of K'ang Hsi reign (1696AD) another mint was established in Chekiang Province casting coins until 1698. More about K'ang Hsi T'ung Pao Part A, or Part B, or Part D, or Part E.